The SEM is a wonderful instrument and the time you spend using it is precious. It is also expensive if you are paying for it yourself, so you have to make the best possible use of it. This book tells you what to do (and what not to do) and will dramatically shorten your learning curve, saving you days, weeks or even months of wasted SEM time. Consider this for a moment: at normal commercial rates, using an SEM for one day is likely to cost at least $1000 US, and maybe double that. If this book saves you just one single hour by giving you just one idea, or by clarifying just one issue for you, or by stopping you making just one mistake, the book has paid for itself. In practice, on the first day alone it will likely pay for itself many times over. Even if you don't have to pay for your SEM time directly, your time on the instrument will be limited. If you squander it fruitlessly it may mean you won't finish your project, or do as well as you might have done, and that could be a sad waste of opportunity. In short, if you are new to SEM of cementitious materials, this book will start you off on the right track and even if you are more experienced, there will be much here of interest for you. There's no complex theory - this book just tells you in plain English what you need to do and why you need to do it. The informal writing style makes everything easy to understand, even if English isn’t your first language. All too often, if you’re new to SEM of cementitious materials, you may find you don’t have access to the detailed help that you really need. I can't actually sit with you while you are working, but if you have my book it's the next best thing. Fracture Surface or Polished section? Secondary or Backscattered Imaging? Tells you which technique to use and why. Starting with simple imaging of fracture surfaces, the book then progresses to preparing and using polished sections, qualitative and quantitative X-ray microanalysis, digital image analysis of backscattered electron images and much more. Examples of images and X-ray spectra of all the major clinker minerals and hydrated cementitious phases help you identify what you are seeing. Shows you how to identify deleterious process in concrete with images and X-ray spectra of the principal causes of damage to concrete, including alkali-silica reaction and sulfate attack. There’s a troubleshooting chapter that helps you determine if your SEM and X-ray equipment is working properly and what to check if you can’t get good quantitative analyses. Polished sections are essential for many types of investigation and a good polished section can make all the difference between either getting excellent results, or spending hours of SEM time getting no useful results at all. Make your sections the right way, as described in Appendix B. "This clearly written and easy-to-read book contains all the important information about SEM of Portland Cement-based materials. 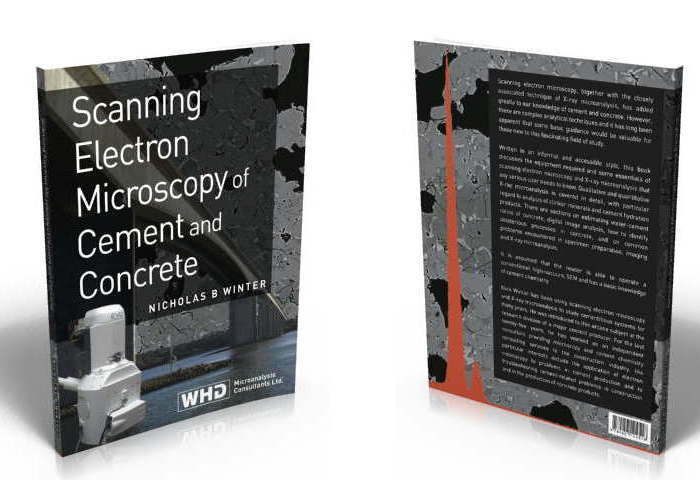 An essential work for those interested in cementitious materials, and not only for cement and concrete researchers!" "Thanks to your book and your email explanations, I am gradually understanding how EDS for cement and concrete works. Thanks so much for the effort you made in writing such a wonderful book. I am yet to see any book in the market that is close to what you authored." "Your book is not only unique for cement and concrete people but also for those from any other discipline. To the best of my knowledge, there is no single manuscript that explains quantitative microanalysis as clearly, understandably and practically as you did in your book. With my compliments." Dr Oguzhan Copuroglu, Assistant Professor, Delft University of Technology, Netherlands. 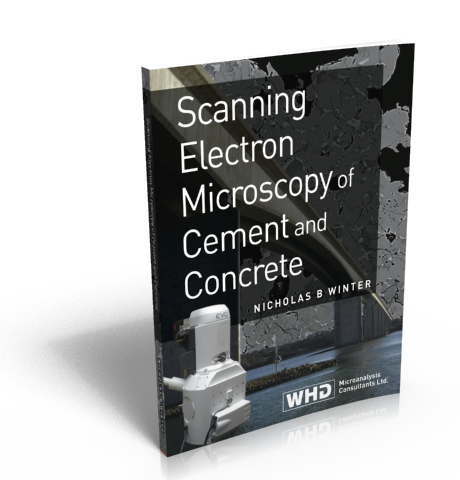 Try "Scanning Electron Microscopy of Cement and Concrete" now, risk-free. In a bookstore, you can look through a book before you buy. You can't do that here, so we offer a 60-day money back guarantee. If you decide it isn't for you for any reason, just return the book to us in good condition within 60 days and we'll refund what you paid for the book (less shipping), no questions asked. I am currently offering all purchasers of the book a free 30 minute consultation using Skype or email. You can ask me anything you like concerning SEM of cement and concrete and I will try to help. This may be helpful if you have a particular problem and are unclear how to go about solving it, or if you would like a more general discussion on some particular issue, or if you don't have anyone available familiar with SEM of cementitious materials and you would like to discuss something in particular. I can't promise to be able to help but I'll do my best. In most cases I can probably suggest broadly what you need to be aiming to do. Alternatively, if you prefer to communicate by email instead of Skype, that's fine - just email me your queries and I'll do my best to help. This bonus alone should be worth more than the cost of the book, but I'm very happy to make this offer as I really want to help you and one-to-one communication is often the best way to achieve that. Obviously, this is a very limited offer as there are only 24 hours in a day so this offer may disappear at any time. You can take advantage of it any time in the three months after your purchase. This book is ONLY available direct from the publisher via this website. You won't find it bookshops or on Amazon. Get your copy using the link below. The book is printed using the latest print-on-demand technology and is typically shipped withhin 1-2 days. How quickly the book reaches you will depend where you are. It is produced in the USA and postal destinations within the USA should receive it within a few days of shipping. International shipping is by first class airmail; the time taken will depend on destination and any delays due to customs. As an example, orders sent to the United Kingdom typically arrive 1-2 weeks after shipping. Just click on the image below to order your copy of "Scanning Electron Microscopy of Cement and Concrete"